IP Result of anti-CSTF1 (IP:10064-2-AP, 2ug; Detection:10064-2-AP 1:500) with NIH/3T3 cells lysate 2500ug. 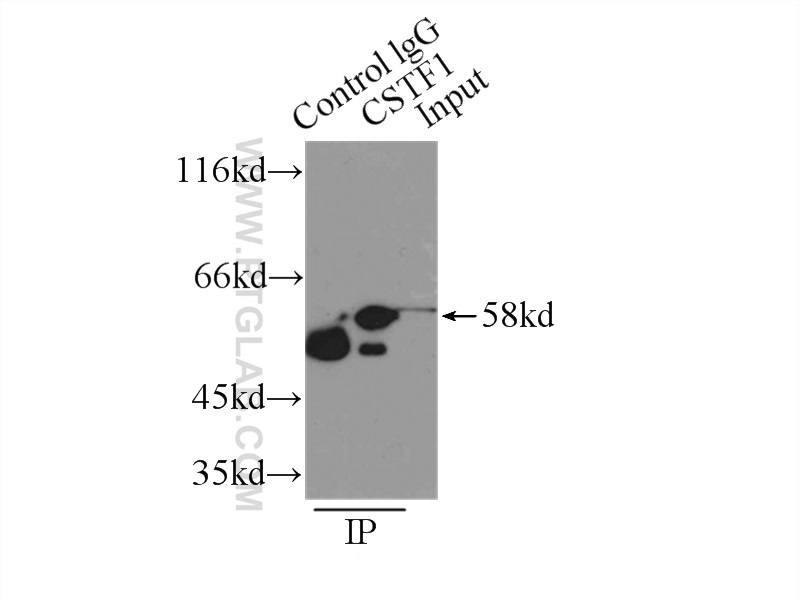 Cleavage stimulation factor (CstF) , a heterotrimeric protein with subunits of 77, 64, and 50 kD (CstF-77, -64, and -50), is a polyadenylation factor that helps to specify the site of processing. CstF recognizes the G+U-rich element, a sequence located downstream of the cleavage site. CstF-50 subunit interacts with the COOH-terminal domain of the RNAP II largest subunit (CTD). This subunit may be responsible for the interaction of CSTF with other factors to form a satable complex on the pre-mRNA, and multiple WD domains are required for protein interactions. The 3' ends of human pre-snRNAs are produced by RNA polymerase II CTD-dependent RNA processing. p53 inhibits mRNA 3' processing through its interaction with the CstF/BARD1 complex. Nicotine elevates sperm motility and induces Pfn1 promoter hypomethylation in mouse testis.